I have pretty much-loved everything Wonka ever put on the shelves. Like, forever. 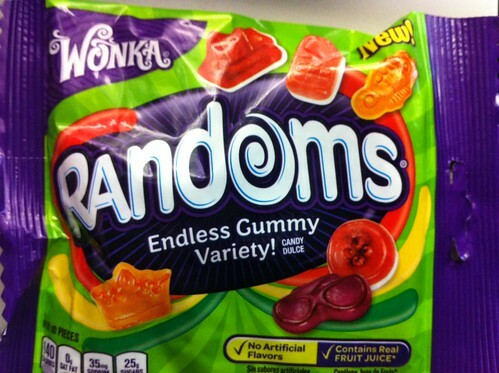 These are RANDOMS and they are gummies that come in all sorts of “random” shapes that are supposed to give you the impression they are all wacky..and…well…random. I am fine with the shapes but none are actually that strange or clever. The taste of these are rather bland, actually. They are decent gummies in texture…but some of them have this brushed-on flavor on their bottoms. It’s a white-marshmellow-like-and-taste–attachment to the base of certain gummies. It’s just as bland and blah as the rest of this bag. STILL waiting on REAL everlasting Gobstoppers.